Please leave a separate comment with a link on each entry and don't forget to leave us your email address so that we could contact you! Keep updated, even if you do not win, you will get a personal 25% discount code for Natalia's shop! This giveaway will run from September, 23rd through October, 23rd, and the lucky winner will be announced on October 27th, 2013.
is my favorite,if only I could afford it! I visited your shop and I love you the beautiful work. I have begun to follow your blog. I have shared your your giveaway on my blog and glad to do it. Amazing beauties. I also shared the giveaway on twitter. I am folloing and sucribed to the Russian Artist Blog. 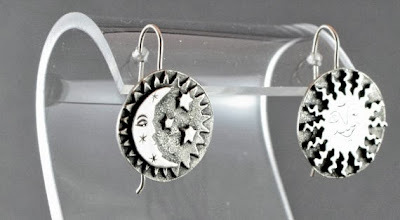 I like interesting, creative idea these earrings. Just shared it on Twitter. I love the Seahorse and starfish hoop earrings! So love the Snowflake necklace, sterling silver. One of a kind artisan necklace. I favorited the Etsy shop under: John Magdziarz. I loved this maple necklace here. It's simple, but pretty nevertheless. I love the Black Swan! maple leaf ring is my fave. Liked Natalia's fb page: io sophia. Your GFC follower as Damla. Maple Leaf pendant (sterling silver) with a natural pink pearl, drop shaped, is the item I love. I like this one....http://www.etsy.com/listing/90066814/australian-green-chrysoprase-sterling?ref=shop_home_active...ciao4now64 at yahoo dot com. I follow Natali's Blog as M.j. on gfc...ciao4now64 a t yahoo dot com. I follow russian artists blog via gfc as M.j. ciao4now64 a t yahoo dot com. I really like the Sterling silver earrings "Seahorse and crab"! 2 - liked on facebook. The Sterling silver ring with turquoise and sugilite is stunning!! I heart Natalia's Jewellery shop on Etsy. My favourite one is the Silver seahorse pendant !